According to recent statistics, only 50% of Tanzanian households use any water treatment method at all. Of those that are treating their water, half are boiling while others use alternative methods. Both boiling water or using no water treatment at all are costly, but in very different ways. Not treating your water leads to preventable illness and death, costing families in their ability to work or go to school, and in expensive doctor visits or even burials. On the other hand, boiling water, although better than no treatment at all, uses expensive fuel and time, increases fluoride in the water, and hurts the environment. Boiling water on a daily basis can be harmful to your health since it can increase the level of fluoride in the water to potentially harmful levels. Furthermore the environment suffers since wood, charcoal and gas, all harmful to the environment, are used for boiling. SWCEA manufactures and distributes the Maji Salama Ceramic Water Filter which incorporates commercial-grade ceramic water filter technology into the design. Best practices are used to manufacture a high quality, effective and affordable household water treatment solution. Using a SWCEA ceramic water filter does not increase the level of fluoride in your water and it can help reduce greenhouse gas emissions. Most importantly it can stop the cycle of resource depletion for families who are boiling or using no treatment at all. The SWCEA filter tested at a 99.99% microbiological effectiveness rate with a life of at least five years. The technology of the SWCEA ceramic water filter is simple, effective, and, sustainable. A round-bottom ceramic pot is made from a mixture of clay, a combustible material, and colloidal silver that enables bacteriostasis and microbiological effectiveness. Any agricultural waste such as sawdust or cornhusks can serve as a combustible additive. After the clay and combustible have both been sieved through a fine mesh, they are mixed together with colloidal silver powder and water until a homogeneous mixture is formed. The mixture is then molded into the pot shape with a rim using a filter press. It is then kiln-fired to about 1000 degrees Celsius, which burns out the combustible material and leaves micro pores coated with the silver to purify the water. During the firing process, about ½ inch (10mm) of activated charcoal is produced within the filter to improve taste and color. The finished filter is placed in a food-grade plastic storage bucket with a spigot at the bottom for dispensing the filtered water. A lid is placed on top of the filter to prevent contamination. The user pours source water, such as from a stream or pond, into the ceramic pot, which filters it into the plastic bucket at a rate of 1 to 3 liters per hour, depending upon the volume of water in the filter. A single filter can provides enough safe drinking water for up to 6 people. 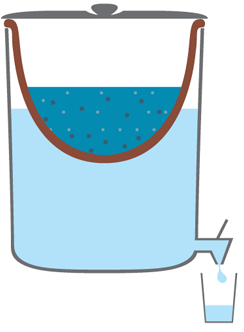 When contaminated water is poured through the SWCEA ceramic water filter, it is purified in three ways: 1.3 micron pore size filters out larger dirt particles, larger bacteria, and parasites; silver impregnation produces a hostile environment for bacteria, preventing any bacteria present from reproducing and the bacteria soon die; ½ inch of activated charcoal improves the taste and color of the water. Chujio za udongo zimekuwa zikipatikana kibiashara kwa muda upatao miaka mia mbili (200). Uhalisi wa chujio ulizalishwa Wiingereza ili kuzuia ugonjwa wa kipindupindu. Tangu hapo, chujio za udongo zimeonekana zikiwa na maendeleo ya mara kwa mara na imetumika kutatua swala la matatizo yaunywaji wa maji yasiyo safi ulimwenguni. Safe Water Ceramics East Africa inasaidia uzalishaji na usambazaji wa chujio za udongo ambazo zimekuwa zikitumika kwenye ulimwengu wa nchi tatu. Umaarufu wa kibiashara waki tekinolojia wa chujio za udongo umekuwa. -matundu madogo ya 1.3 micron huchuja uchafu, bakteria na vijidudu. -Uwepo wa silver kwenye chujio huzuia mazingira ya uzalianaji wa bacteria na bacteria hufia hapohapo. -1/2 ya mkaa uliochomeka huongeza ladha na rangi ya maji .